Ilan Pappe deserves credit. He goes further than most Israelis in deconstructing the Jewish state’s historical revisionism, which he calls a “Zionist whitewash of words.” But does Pappe go far enough? 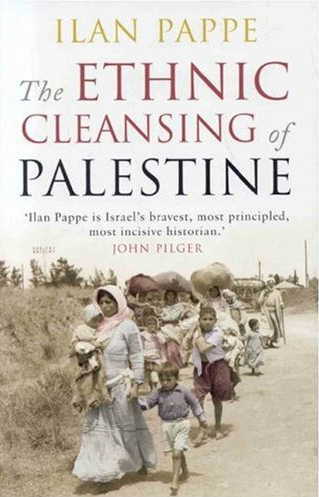 The iconoclastic Haifa University historian has written a book, The Ethnic Cleansing of Palestine, destroying the “Israeli foundational myth,” which he describes as a “sheer fabrication.” Pappe sets straight the Israeli historiography. Central to Zionist historical revisionism is Nakba (catastrophe) denial. Pappe affirms the occurrence of the Nakba which he states was not a “voluntary flight” but part of a Zionist blueprint (Plan Dalet) for the ethnic cleansing of Palestine. It was ethnic cleansing, but was it not also something more sinister? Pappe identifies the perpetrators of the Nakba as the “heroes of the Jewish war of independence,” of who the best known is David Ben-Gurion, “the architect” of ethnic cleansing. Ben-Gurion is more accurately viewed as one of history’s vilest war criminals. Pappe writes, “[C]ontrary to claims historians such as Benny Morris have made, Plan Dalet was handed down to the brigade officers not as vague guidelines, but as clear-cut operational orders for action.” The action resulted in the expulsion of almost 800,000 people and the destruction of 531 villages and 11 urban neighborhoods. Palestinian villages were literally wiped off the map by Zionists. In addition to the ethnic cleansing and massacres, Pappe details the crimes committed by the Zionists against Palestinians: bioterror, imprisonment, abuses, ghettoization, rapes (Ben-Gurion was, perversely, informed of every case), looting, and desecration of religious sites. The Zionists were not alone in their perfidy. There were many collaborators. The British were instrumental; Jordan’s King Abdullah I was driven by his greed for a bigger kingdom ; the Druze and also the Circassians collaborated. The Arab Legion “stood idly by.” The UN is culpable; the US plays a key role to this day abetted by the UN, Canada, and the EU. Even some Palestinians collaborated against their kinsfolk. No race, ethnicity, or group has a monopoly on morality. The British regime levered in the Zionists, then they disarmed and disadvantaged the indigenous Palestinians. Zionist militarism and political opportunism were key to the ethnic cleansing. The Zionists first turned on their hospitable Palestinian hosts, recruiting Palestinian informants; then, they turned on Britain after WWII. The British scurried off, and the UN imposed a partition on Palestine. Pappe writes, “It is clear that by accepting the Partition Resolution, the UN totally ignored the ethnic composition of the country's population … to compensate the Jews for the Nazi Holocaust in Europe.” The Palestinian majority wound up with 42 percent of the land, the Jews were gifted 56 percent of Palestinian land, and Jerusalem was designated an international city. Palestinians were outgunned and outmanned by Jewish military. Zionist propaganda declared the Palestinians a fifth column (an absurd declaration given that the Palestinians were the majority and the Jews were a minority) and warned of another Holocaust. Palestinians were forced to leave on foot, without food and water, many dying of thirst and hunger along the way. “Again, the inevitable question present [sic] itself: three years after the Holocaust, what went through the minds of those Jews who watched these wretched people pass by?” Pappe gives no answer, noting that Israeli Jews dealt with the immorality of Plan Dalet by crocodile tears and dehumanizing the Palestinians. For all his courage debunking Zionist disinformation and forthrightness criticizing Zionist malevolence, Pappe is suspect on the definitional question of genocide. Why would Pappe skirt the label of “genocide”? This is unclear. If, however, genocide is acknowledged, it would draw a parallel with the WWII Holocaust. The Jewish state’s emergence owes much to the WWII Holocaust; it garnered world sympathy, massive reparations, and evoked an admonition to all: “Never again.” If the Nakba is defined as a genocide, it undermines any pretense to the legitimacy of Israel and its emotional underpinning by the WWII Holocaust. It accuses many Holocaust survivors of guilt in inflicting a Holocaust on another people. The term “ethnic cleansing” does not evoke the same horror in people’s minds as does “genocide,” especially when the euphemism of “transfer” is used to describe ethnic cleansing. Nonetheless, much of the text in Pappe’s book supports a charge of genocide. Pappe admits, “There never has been an end to Israel’s killing of Palestinians.” (p. 258) The wording is strange. A state killing a people? Obfuscation? Is it not Israeli Jews and their accomplices killing Palestinians!? Pappe’s colleague, Haifa University geography professor Arnon Soffer admitted, “We were murderous, but it was not for the sake of malice.” (p. 223) On page 248, Soffer is quoted again: “So, if we want to remain alive, we have to kill and kill and kill. All day, every day.” One imagines that Haifa University faculty meetings are quite eventful. Here’s the thing about ethnic cleansing: it’s not the same as genocide. The latter [genocide] is consciously aimed at destroying the people-hood of a people by attacking how, as well as where, they live, their ideas, their outlook, their culture etc etc. The former [ethnic cleansing] displaces people, but the question of whether there is a genocidal intention, or merely a desire to take over the land and property of others, is left moot. It is ALL genocide. The intention of the Haganah was to genocide the Palestinians. It’s very convenient to say, à la Golda Meir, that the Zionists didn’t think of the Palestinians as a people or nationality, just an inconvenient obstacle. The FACT is they prepared and executed genocide. It doesn't matter, either, that the Zionists didn’t get all the Palestinians in one fell swoop, but have dragged it out over the last 58 years. It is still genocide. To suggest the survivors of the Judeocide were incapable of such a thing, which seems to be the only substance at the heart of the liberal Zionists’ argument, is utter nonsense. Were these survivors not psychically damaged by what they experienced before they were “liberated”? Such people were the ideal human material to set upon the Palestinians like wild beasts. Ethnic cleansing can happen between two peoples of the same, or contiguous or neighboring territories, when one strives to displace the other. The cannon-fodder and bullet-stoppers with which the world imperialist system enabled the Zionists to populate a foothold in a territory coveted by the Zionists cannot be considered a people. They were an imperialist praetorian guard but, conveniently, large numbers of them were also so desperate and down-and-out and displaced several times over that they could garner sympathy. But 99% of these Zionist fodder who got there before 1945 had NOTHING to do with that part of the world except for the fact of either illegal immigration or British-imperialist-approved immigration. One hundred percent of those who got there between 1945 and 1947 were persons from various European countries who were brought there from DP camps. This conflict is not ethnic/tribal conflict, not Hutu-Tutsi, not Serb-Croat. Pappe is especially noxious on this point, as he compares what the Zionists did in the West Bank specifically to Yugoslavia in the 1990s. It’s important to hit these people hard, especially intellectuals and academics like historian Pappe. There are opponents of the antics of the Zionist junta in the Occupied Territories, such as Uri Avnery, Jeff Halper et al., who consider themselves part of an Israeli nationality. If they really mean it, they should defend their claim to Israeli status and lift a finger to smash the Zionist lie that citizenship in their state is “Jewish” or otherwise, and to smash along with it the idea that the citizenship conferred on those ‘48-Palestinians can be not Jewish, not Palestinian, but ... “Arab”! These liberal Zionists don’t want to lift that finger. They conciliate the Jewish citizenship thing instead, and thereby become complicit specifically and explicitly in Zionist suppression and genocide of Palestinian identity. That judgment may seem harsh, but is it not just? Pappe does go further than most Israeli intellectuals. He tackles the Nakba and the right of refugees to return. He decries the “horrific repression” of the Palestinians and understands how it helps provoke suicide bombings. Pappe’s language sometimes betrays him. Why is it an “Israel-Palestine conflict”? It implies an equivalency between the two sides. There is no equivalency. It is a Zionist genocide perpetrated against Palestinians, abetted by much of the bystanding world. This is what it has always been and continues to be. Kim Petersen, Co-Editor of Dissident Voice, can be reached at: kim@dissidentvoice.org. Transjordan (nowadays Jordan) is a country created by Britain through splitting the Palestinian Mandate in 1921. The Hashemites who rule in Jordan are an artificial institution of the British as well -- a Hejazi transplant into the artificial country. Pappe refutes the notion propounded by some that Israeli rejectionism is, in fact, US rejectionism. See Noam Chomsky, “Rejectionism and Accommodation” in Fateful Triangle: The United States, Israel & The Palestinians (Cambridge, MA: South End Press, 1999), 39-88. In a pro-Israel paper, professors John J. Mearsheimer and Stephen Walt describe the persisting influence of the Jewish lobby in the US: “The Israel Lobby and U.S. Foreign Policy,” Working Paper Number:RWP06-011, 13 March 2006. Noam Chomsky maintains otherwise. See “The Israel Lobby?” ZNet, 26 March 2006. Raphael Lemkin, “Genocide.” In Axis Rule in Occupied Europe: Laws of Occupation -- Analysis of Government -- Proposals for Redress (Washington, D.C.: Carnegie Endowment for International Peace, 1944), 79-95. Available at prevent genocide international. Lemkin sees “genocide” as a crime against humanity involving myriad actions intended to “destroy or cripple permanently a human group. Lemkin, “Genocide as a Crime under International Law,” American Journal of International Law (1947) Volume 41(1):145-151. Available at prevent genocide international.